My brother Alex told me that the hops would be ready when the tips started turning brown, so I guess it’s go time. I planted them with a long rope to climb all the way up to my office window on the top floor, and they didn’t make it last year, but this year they did, and how. I pulled one off the vine and it smells delicious. Some people would say BO, I say IPA. It’s time to drop the rope and pull all the hop blossoms (flowers, blooms, what are they called anyway?) and get them dried. Or better yet call up Alex and set up a fresh hop ale brew day. 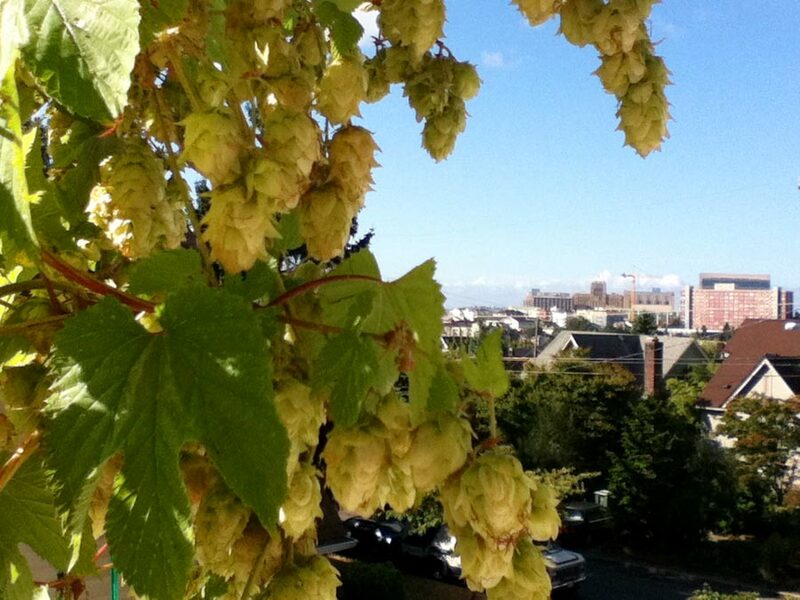 Get to know your Urban Farmer’s Almanac history and read about the history of these hops here. Congrats! Make sure you find a way to dry them well in this damp weather– hop mold is some of the worst and will completely ruin them. But there’s nothing like a good, backyard IPA! Yep, they’re drying in the basement as of yesterday. Looking forward to brewing.